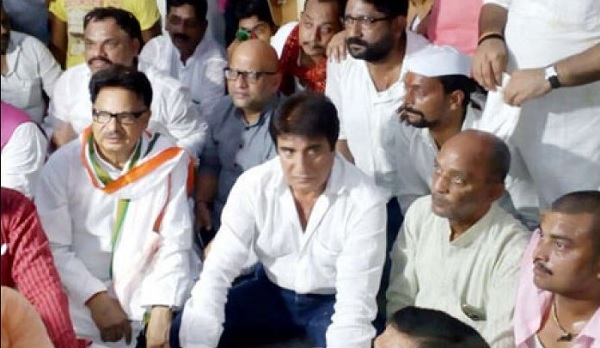 Varanasi : Uttar Pradesh Congress Committee president Raj Babbar, P L Punia and many other party leaders has been taken in the police custody in Varanasi, while they were trying to reach the troubled Banaras Hindu University (BHU) campus on Sunday evening. Raj Babbar, PL Punia, Ajay Rai and many other senior leaders has been taken in police custody after landing at LBS International Airport at Babatpur. They all moved towards BHU to meet the students admitted to trauma center after suffering injuries in police action on Saturday late night. While on the other hand UP CM Yogi Adityanath today ordered an investigation into last night's violence at the campus of Banaras Hindu University or BHU, in which a woman protester was beaten up by policemen. Students were lathicharged by police following overnight violence in BHU.Raj Babbar demanded sacking of BHU vice-chancellor for the alleged brutality committed on girl students. The protesting students have claimed that BHU guards didn’t help the victim and instead questioned her for roaming outside the hostel after 6 pm. Raj Babbar said about the action of police that, "It is shocking that I am not being allowed to reach BHU to meet the injured girls and know their problem. policemen started a bid to stop me from airport." "It is unfortunate that when the entire world had started celebrating Daughter's Day the girl students of BHU were being brutalized by the men in khaki inside their hostels for no fault," Raj Babbar added.